Help us raise $300,000 to transform the future for 500 additional students in Miami-Dade County's most challenged communities! 10 years in the making: an epic celebration of mentorship through the arts. 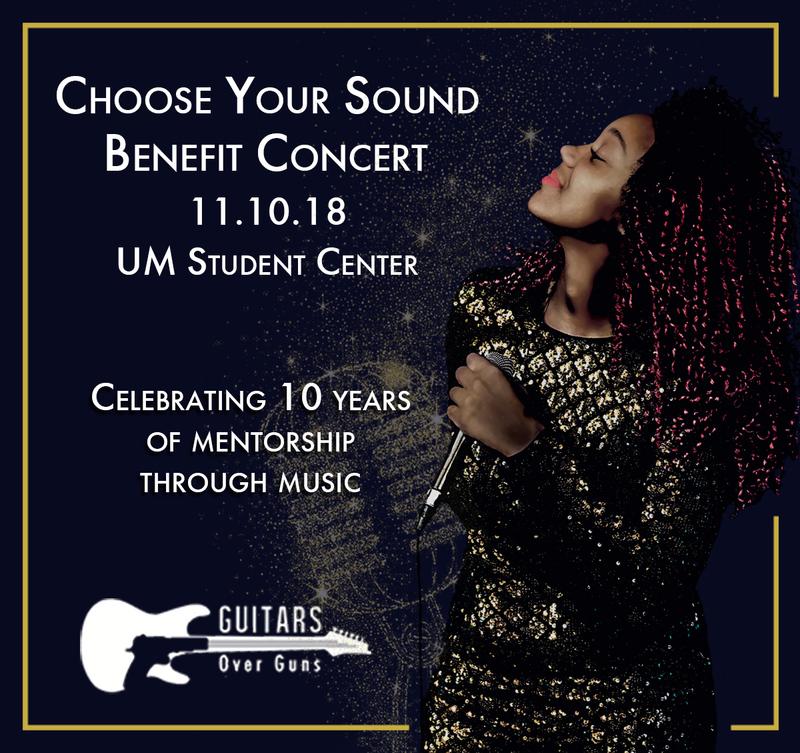 Join Guitars Over Guns for our 5th Annual Choose Your Sound Benefit Concert! Guests will enjoy incredible performances from Guitars Over Guns mentors, alumni and special guests, not to mention a selection of award-winning eats and beverages from some of Miami's hottest restaurants and an unbelievable silent auction featuring 5-star trips, experiences, fine art and so much more. The evening will be emceed by CBS Miami news personality Jim Berry, and will feature a retrospective look at the organization's 10 years of empowering Miami-Dade youth through music and mentorship. This event celebrates Guitars Over Guns' 10 years of of making music and changing lives. Cuts in funding for the arts and after-school programs mean our students have fewer opportunities than ever, and as the news reports of youth violence continue to pour in, we are reminded all too often that this type of work has never been more important. Grab a ticket and be part of a movement that empowers deserving youth in our community to create, succeed and thrive! Want to do even more to support our community's future leaders? Click here to learn about sponsorship opportunities. Donations of $5000 or more feature great perks including VIP Tables for 10, plus naming and branding opportunities for your company or business. To pay by check, make check payable to "Guitars Over Guns" and note the package/level you are selecting in the memo line.